Gunmetal Magic, written by the wife and husband team known as Ilona Andrews, is an urban fantasy novel set in the same world as the Kate Daniels series. It’s about Andrea Nash, Kate’s best friend, and a novella about Kate titled “Magic Gifts” is also included with the novel. “Magic Gifts” overlaps with the timeline in Gunmetal Magic, and there is a part in the novel that comes after Kate’s adventure and ties in with it. While it’s not necessary to read “Magic Gifts” first, it does provide more details on what happened to Kate, and I think it would be better to read it first. Gunmetal Magic is enough of a stand alone story that it could be read without reading the five Kate Daniels books first, but I’d recommend readers new to this world begin with the Kate Daniels series. The first book, Magic Bites, is not quite as good as this one (or, for that matter, the rest of the series, especially books 3 and 4). However, Gunmetal Magic does reference events from the first five Kate Daniels books, and I think would be more fun to discover previous occurrences by actually reading about them as they happen in the books. For those new to the books, this review will not include spoilers for the previous books in the Kate Daniels series other than a little about what happened to Andrea recently. Private Investigator Andrea Nash, formerly of the Order of Knights of Merciful Aid, has had better days. First, she awakens from a nightmare about a dreadful event from her past to a neighbor frantically pounding on her door. Her blind husband is missing, and a former Knight of the Order seems like a prime candidate for finding missing persons. Andrea does rescue the man from terrible creatures and bring him home, but she can’t even finish cleaning the icky creature goo off herself without being called in to conduct another larger investigation. Four people from the Pack were murdered the night before, and Andrea is asked to learn what happened to them. She agrees to help, even after she finds out the business they were working for is owned by her ex-boyfriend Raphael and investigating this case will mean dealing with him—and his new drop-dead gorgeous, tall, blond fiancée—after a very bad breakup. The deeper Andrea becomes involved in the case, the more apparent it is that Raphael is the least of her problems. Andrea has only begun to move forward with her life, but it may be over before she can pull the pieces together if she can’t prevent the killer from carrying out bigger plans. 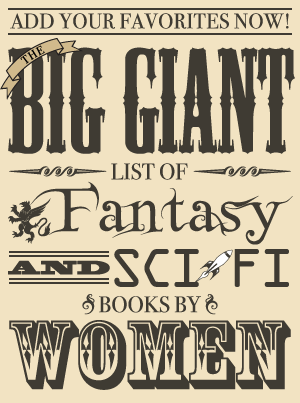 The Kate Daniels series is one of my favorite, if not my very favorite, urban fantasy series. When I heard that 2012 would bring a book about Andrea instead of a continuation of Kate’s story, I have to admit I was a bit disappointed because one reason I love the series so much is Kate herself. Her sense of humor shines through her narrative voice, and she changes so much over the course of the series, only slowly opening up to both the reader and the other characters about her history. In particular, I find the story that ties in with Kate’s secret especially compelling, and given the note the last book ended on, I was eager to discover where it went next. Because Kate is such a highlight of the books for me, I was torn about reading Gunmetal Magic, but in the end I decided there was no way to pass up a related story—and I’m glad I did. It may not have been focused on Kate, but it had the other things I enjoy about Ilona Andrews’ books—the sense of humor, the vibrant three dimensional characters, the interweaving of myth, and action-packed scenes. Gunmetal Magic is a tale of one woman’s journey toward self-acceptance, a love story, and a fun mythical mystery adventure based on Egyptian lore. As can be expected from a book by Ilona Andrews, Gunmetal Magic is highly entertaining, and the highlight of the book for me was the characters. I love how most of them have a sense of humor and don’t follow common archetypes. Even the secondary characters stand out as individuals, and one of my particular favorites is Roman, a volhv of Chernobog (otherwise known as the god of “Everything Bad and Evil” if you ask Kate). Being a servant to the dark god is sort of the family business, and Roman’s father is the Black Volhv himself. Roman has to maintain a certain appearance (he looks menacing, according to Andrea) and has some scary powers. Yet he is a rather jocular, personable fellow capable of having fun (and not in a darkly humorous my-idea-of-fun-is-destroying-the-world sort of way). Andrea observes that he seems to think of being the servant of darkness as a 9 to 5 job and that he seems to be trying to make the most out of life when he doesn’t have to be in that role. While I love my darker characters, I also like to see characters who aren’t easily summed up by a single aspect of their personality, and I think this combination of a dark side with a lighthearted side makes Roman very intriguing and unusual. On the subject of characterization, I also appreciated that Andrea and Kate were very different characters despite some similarities. Both of them have the tough, badass attitude so common in urban fantasy, but they also manage not to seem like yet more kickass women just like every other one out there because they have different aspects to their personalities. They’re both good with weapons; Kate with her sword and Andrea with a gun. They have differences on the surface, like Kate’s upbringing that means she’s a treasure trove of mythical information and Andrea’s love of romance novels, but their differences go deeper than that. Each of them has had tragedies in their pasts, but they seem to deal with them very differently. Andrea gave me the impression of being much more open than Kate since the very opening scene shows her waking up from a nightmare, hiding in her closet clutching a butcher knife. Kate, on the other hand, took three whole books to open up to the reader enough to even share the full story of her past (which is very much in keeping with her upbringing and how it’s influenced her character). Andrea’s perspective seems a bit more introspective than Kate’s, and she seems more prone to showing how wounded she actually is. That’s not to say she mopes and dwells on her misfortunes without taking any action in this book. She does quite the opposite since she does take control of her life. She just seems to feel her inner turmoil more keenly than Kate does, and I appreciate the differences in these two characters who may seem similar on the outside. In general, Ilona Andrews does a wonderful job of keeping their books interesting by combining action and character development/interaction and spreading them out so they are well-balanced. This particular book seemed uneven to me for awhile, but I really can’t say it started slowly since there was plenty of action as early as the very first chapter. I’ve come to the conclusion that there was too much setup that wasn’t advancing the plot. Andrea’s rescue in the first chapter seemed more of an excuse to show her in action and share her past as part of the Order than integral to the storyline, and some of the fast-paced action of the early investigation seemed ultimately pointless other than to show the dangers of magic. There were quite a few infodumps in the beginning as well so I do think part of my trouble with staying engaged with the story early on was that I already knew a lot of what was being told already. Once the investigation began to go somewhere and more of the other characters were involved, I had a lot of fun with it. 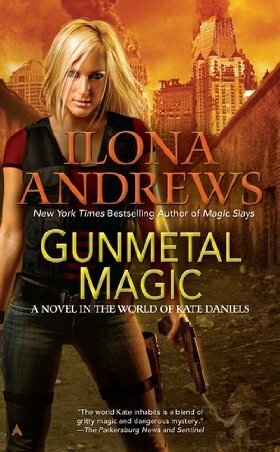 While I didn’t enjoy it as much as most of the Kate Daniels books, I really enjoyed Gunmetal Magic for all the same reasons I read the series—the combination of purely entertaining storytelling, humor, drama, three-dimensional characters, the right amount of romance, snappy dialogue, and mythology. It’s also very satisfying to see Andrea’s evolution as a character as she comes into her own and learns to accept herself, and the novella “Magic Gifts” covering the story of Kate and the Vikings is a great additional bonus.